Fine Art Shippers is proud to offer an array of professional fine art shipping and handling services in New York and throughout the United States. NEW YORK, NY, THE UNITED STATES OF AMERICA, March 12, 2019 /EINPresswire.com/ -- Fine Art Shippers is proud to offer comprehensive fine art shipping services in New York and throughout the United States. With over two decades of experience, our art logistics company1 is dedicated to providing artists, gallerists, dealers, and private collectors with safe, reliable, and custom-tailored solutions for high-value, delicate, and fragile cargo. From moving a small piece of art within the same city to shipping large outdoor sculptures over a long distance, we can handle any art logistics need professionally and promptly! Fine Art Shippers is proficient in shipping valuables of any kind, from small and extremely fragile items to art installations and antique furniture. 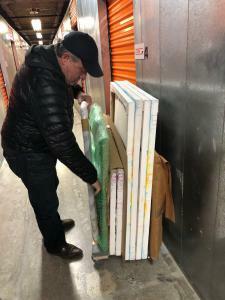 This allows us to work with many reputable fine art galleries and antique dealers who entrust our team to ship their precious cargo nationally and internationally. However, what we love the most is shipping fine art for contemporary artists, both emerging and well-established. For example, not so long ago, we had the pleasure of handling and moving a collection of very beautiful paintings by Luz Fandino2. Luz Fandino is a talented contemporary artist who started her career doing iconography research for the Smithsonian Institution in the 1990s. Fandino was born in Colombia, but now she lives and works in Brazil. This amazing artist is largely known for her intuitive paintings that show many layers of feeling and emotion at the same time. Fandino’s works are poetic and ambiguous. They attract the attention of the viewers, inviting to stop and contemplate the flow of imagination. It was a great pleasure for Fine Art Shippers to handle a whole collection of paintings by Luz Fandino, and we definitely look forward to doing another art logistics job for this great artist. 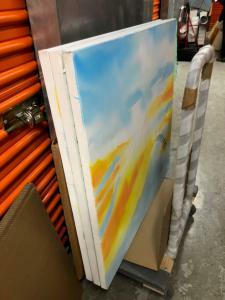 In addition to moving and shipping artwork, Fine Art Shippers also offers a scope of other fine art services, including short-term and long-term art storage3 in New York, Miami, Washington, D.C., Chicago, Denver, Los Angeles, and other cities throughout the United States and also abroad. We provide fully equipped climate-controlled facilities for the professional and safe storage of fine art, antiques, and other objects of value. Whatever the requirements, we have an option to satisfy even the most complex art storage needs. 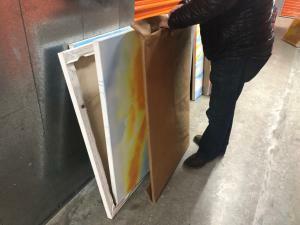 Besides, Fine Art Shippers offers art installation, crate fabrication, custom packing, art insurance, exhibition set-up, white glove art delivery, and many other art handling and logistics services one may expect from a reputable fine art shipping company. Please do not hesitate to contact our dedicated team for any assistance required! We will be happy to work with you and provide you with high-quality fine art services at really affordable prices.